Valgray’s Border Collie and Animal Rescue started in 1978 and has, over the years, become respected as one of the most successful rescue charities which caters for the very unique nature of the Border Collie and its close relatives. You just have to look around the Agility circuit to see just how many dogs with a Valgray’s name are competing with their new found families. As a thank you it was decided over the years to give something back to the new owners of the Valgray’s Rescue Dogs and so the Valgray’s Dog of the Year was born and is now a very coveted award to be won. 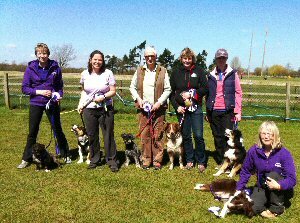 With special thanks to Mid Downs Dog Agility Club for allowing us to present our awards at their Easter Celebration Show. The presentation to the 2012 winner of Valgrays Dog of the Year - Ann Young with Jack Be Nimble of Valgrays with a huge 1184 points, took place at Wallingford Agility Club Show at Newbury Show Ground on Saturday , 20 April 2013, by kind permission of the Wallingford's Committee and went. Well done to everyone. Remember if you want to be part of Valgrays Dog if the Year, you must send your points into the DARL League. Huge thanks go to Karen Fuller for putting the points all together. Valgrays Dog of the Year will be held at the Darl Final on the Sunday - 10th June 2012. Many thanks to Karen in getting the points together. If you are among the winners and cannot make this show please let Valgrays know.